venus nuda ossa mare, 2017, Unglazed porcelain, 6 x 6 x 14 inches (ceramic), 9 x 9 x 20.5 inches (container). aita gogokoena, 2017, Glazed porcelain, 10 x 6 x 2 inches (ceramic), 11.5 x 7 x 6 inches (container). opuntioid iighááh, 2017, Porcelain with underglaze, 9 x 5 x 13 inches (ceramic), 13 x 7 x 17 inches (container). koralo de sfera lotuso, 2017, Porcelain with underglaze, 6 x 6 x 9 inches (ceramic), 10.5 x 10.5 x 16 inches (container). xajka, 2017, Porcelain with underglaze, 3 x 3 x 5 inches (ceramic), 7 x 7 x 10 inches (container). eusynstyela misakiensis, 2013, Glazed porcelain, 9 x 5 x 5 inches (ceramic), 6.5 x 6.5 x 18.5 inches (container). cogumelos de liquen lustroso, 2017, Glazed porcelain, 5 x 6 x 7 inches (ceramic), 8.5 x 8.5 x 8.5 inches (container). ho phatloha ho hoholod, 2017, Porcelain with underglaze and nichrome wire, 5 x 4.5 x 7 inches (ceramic), 10 x 10 x 12.5 inches (container). sagte pynappel kaktus, 2017, Glazed porcelain, 5 x 5 x 10 inches (ceramic), 9 x 9 x 23 inches (container). 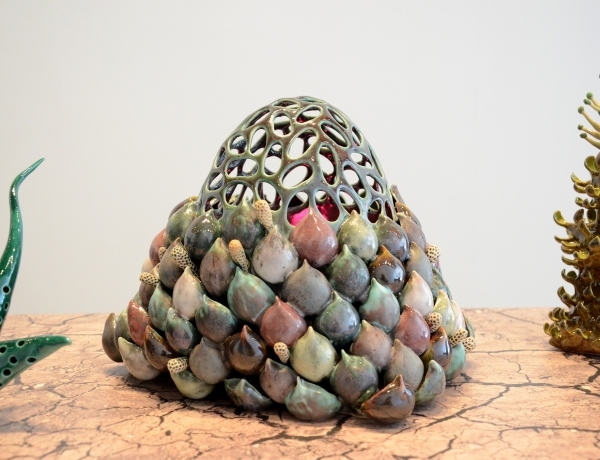 stomata melongere comantem, 2012, Glazed porcelain, 14 x 10 x 9 inches (ceramic), 16.25 x 10 x 9 inches (container). Chris Garofalo (b. Springfield, Illinois) creates ceramic sculptures that draw inspiration from naturally occurring plant forms, merging familiar features evocative of tendrils, leaves, and ferns, with characteristics that have yet to evolve in nature. Following extensive experience with printmaking and graphic design, Garofalo was introduced to ceramic. An avid gardener, she took quickly to the medium finding similarities in the tactile and olfactory sensations of working with dirt and clay. This love of gardening coupled with the observation of the diverse behavior and appearance of plants as they grow, inspired the content and form of her first sculptures. In her current works, Chris Garofalo attends to principle properties of development yet disregards behavioral, environmental, genetic, and matting patterns to reimagine an evolutionary history of our planet filled with forms that are at once recognizable and indefinable. Garofalo earned a BFA from Saint Mary’s College, Notre Dame in South Bend, Indiana. She has exhibited her ceramic sculptures since 1991 holding exhibitions at galleries and institutions internationally including Bureau Gallery, New York; R & Company, New York; Hyde Park Art Center, Chicago; Elmhurst Art Museum, Elmhurst, Illinois; Mathew Marks Gallery, New York; Muskegon Museum of Art, Muskegon; Three Rivers Arts Festival, Pittsburg; Nouveau Musée National de Monaco, Monaco; Garfield Park Conservatory, Chicago; and Foundazione Mazzullo, Taormino, Sicily. In 2007, she received the Joan Mitchell Foundation Painter and Sculptor Award. Chris Garofalo has lived and worked in Chicago since 1980.
Review of PRECIOUS FRAGMENTS exquisite longing at Rhona Hoffman Gallery. Review of Edaphology of a Superterrestial Panmictic Population at Rhona Hoffman Gallery.